• CAMPANA S., 2018. Mapping the Archaeological continuum. Filling ‘empty’ Mediterranean Landscapes. New York: Springer. • CAMPANA S. & M. Forte (Eds) 2017. Digital Methods and Remote Sensing in Archaeology. Archaeology in the Age of Sensing. New York: Springer. • CAMPANA S., 2018. EMPTYSCAPES. Towards Filling Gaps in Mediterranean Landscape Archaeology. In: Humans and environmental sustainability: Lessons from the past ecosystems of Europe and Northern Africa. p. 8-15, ISBN: 978-88-943442-0-2, Modena, 26-28 febbraio. • CAMPANA S., 2017. Emptyscapes: filling an ‘empty’ Mediterranean landscape at Rusellae, Italy. 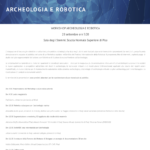 Antiquity, Vol: 91, Issue: 359, pp. 1223–1240. • CAMPANA S., 2017. Vers l’implentation de la cartographie du continuum archéologique. Nouvelles perspectives et limites actuelles de l’archéologie préventive en Italie. Archéologies numériques, 1(2), 1-14. • CAMPANA S., 2017. Sensing Ruralscapes. Third-Wave Archaeological Survey in the Mediterranean Area, in M. Forte & S. Campana (eds.) Archaeology in the Age of Sensing. New York: Springer, pp.113-145. • CAMPANA S., 2017. Drones in Archaeology. State-of-the-Art and Perspectives, International Journal of Archaeological Prospection: DOI: 10.1002/arp.1569. • CAMPANA S., 2017. Empty Spaces and Empty Phases within Mediterranean Landscapes: The ‘Emptyscapes’ project. In Belvedere, O., & Bergemann, J. (2017). La prospezione archeologica: metodi tecnico-scientifici e approccio storico in Germania e in Italia/Survey-Archaeologie: naturwissenschaftlich-technische versus historische Methode in Italien und Deutschland (O. Belvedere, & J. Bergemann, a cura di). Rahden/Westf: Verlag Marie Leidorf GmbH, pp.41-56. • CAMPANA S., 2016. Towards mapping the archaeological continuum. New perspectives and current limitations in Planning Led Archaeology in Italy. In F. Boschi (Ed. ), Preventive Archaeology. Urban sites and landscapes, (Ravenna 1-12 July 2013), pp.27-40. • CAMPANA S., 2015. Emptyscapes: filling ‘empty’ mediterranean landscapes, mapping the archaeological continuum, 11th International Conference on Archaeological Prospection, Warsaw 15–19 September 2015: 149-152. • CAMPANA S., 2015. From ArcLand to Emptyscapes: Filling ‘empty’ landscapes, mapping the archaeological continuum, in Axel G. Posluschny (ed) Sensing the Past Contributions from the ArcLand Conference on Remote Sensing for Archaeology: 106-107. • CAMPANA, S. Filling gaps in space and time at Veii. ‘Emptyscapes’ project. In Cerasuolo, O. & J. Tabolli. Veii – An Etruscan City. University of Texas Press. • CAMPANA S. Droni in Archeologia. Applicazioni e Prospettive. Archeologia Aerea, 10. 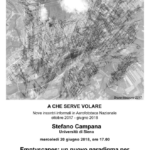 • CAMPANA S. ‘Emptyscapes’ and Medieval Landscapes: is a new wave of research changing content and understanding of the rural archaeological record? In Mediterranean Landscapes In Post Antiquity: New Frontiers And New Perspectives, Cambridge Scholars Publisher.